President Donald Trump says his meeting with Russian President Vladimir Putin may be the "easiest" part of a week-long European trip. As President Donald Trump predicts that his one-on-one meeting with Russian President Vladimir Putin may be the "easiest" part of a week-long trip that includes a North Atlantic Treaty Organization summit and a visit to the United Kingdom, Russian stocks are in focus as investors bet on improving relations between the U.S. and Russia. "So, I have NATO, I have the U.K. which is somewhat in turmoil, and I have Putin," Trump told reporters before boarding presidential helicopter Marine One on Tuesday, July 10. "Frankly, Putin may be the easiest of them all. Who would think?" The president is scheduled to meet with Putin on July 16 in Helsinki, and there is hope that relations between the two countries will improve and reduce the potential of additional sanctions. Russian government officials are in discussions with their Washington counterparts to strike at least one deal that would allow Trump to declare the meeting a success, a senior Russian official told Bloomberg. Investors appear to be anticipating improved relations as the MOEX Russia Index (IMOEX), the main ruble-denominated benchmark of the Russian stock market, has gained approximately 0.8% in the last five days, although the exchange erased earlier gains today, falling 0.3%. The rise of the IMOEX also coincides with higher Brent crude oil prices, the global benchmark for oil. Russian petroleum company Rosneft (RNFTF , which has a market capitalization of $70 billion, gained about 2% over the past week as Brent prices pushed above $77 per barrel. Still, at least one Republican senator is warning that relations may not improve. Sen. John Kennedy (R-La. ), who recently returned from a congressional trip to Russia, said that dealing with the Russian government is like "dealing with the mafia." While the senator said he had no issue with Trump meeting privately with Putin, he doesn't anticipate a diplomatic development. "You can't trust Putin," Kennedy told reporters Monday on Capitol Hill. "I think the best we can do is try to contain him." Crimea will also "loom large" over Trump and Putin's talks, according to Steven Pifer, a nonresident senior fellow in the Arms Control and Non-Proliferation Initiative, Center for 21st Century Security and Intelligence, and the Center on the United States and Europe at the Brookings Institution. "There is a good chance that Putin, probably in the one-on-one meeting, will spin a case for Trump accepting Crimea's annexation," Pifer wrote on July 9. "Putin can make a historical case for Crimea to be Russian. The case will sound reasonable to uninformed ears. It will be flawed." Trump needs to understand the specifics of this situation, otherwise he risks walking into a trap, Pifer said. Before Trump meets with Putin, the president will attend a NATO summit in Brussels, then travel to the U.K. to meet with Prime Minister Theresa May and sneak in a golf trip in Scotland. Trump will participate in meetings with 28 allies on Wednesday, and the sessions will center on NATO's mission of countering Russia, according to U.S. ambassador to NATO, Kay Bailey Hutchinson. "Our major areas of deterrence would be Russia and the malign activities of Russia, the efforts of Russia to divide our democratic nation, INF Treaty violations," Hutchinson told reporters last week. The U.S. has accused Russia of violating the Intermediate-Range Nuclear Forces Treaty, which generally forbids nuclear and conventional missiles in Europe. But Trump's comments seem to counter that initiative, as the president wrote in a June 28 Tweet that "Russia continues to say they had nothing to do with Meddling in our Election," and instead asked why isn't "Hillary/Russia being looked at?" Russia continues to say they had nothing to do with Meddling in our Election! Where is the DNC Server, and why didn't Shady James Comey and the now disgraced FBI agents take and closely examine it? Why isn't Hillary/Russia being looked at? So many questions, so much corruption! The president has also called out NATO allies for failing to spend enough on defense, which irked President of the European Council Donald Tusk, who said the EU spends more on defense than Russia and as much as China. Trump will then travel to the U.K., where there is a chance he could be greeted by a giant inflatable baby Trump, and will attend a black-tie business dinner at Blenheim Palace, working meetings with Prime Minister Theresa May at her country home at Chequers, and a tea-time visit with Queen Elizabeth at Windsor Castle, according to USA Today. The president will bridge the trip to London and Helsinki with a weekend in Scotland, where he will -- naturally -- play golf. Trump owns two golf courses in Scotland, including the Trump International Golf Links in Aberdeen and Trump Turnberry in Ayrshire. 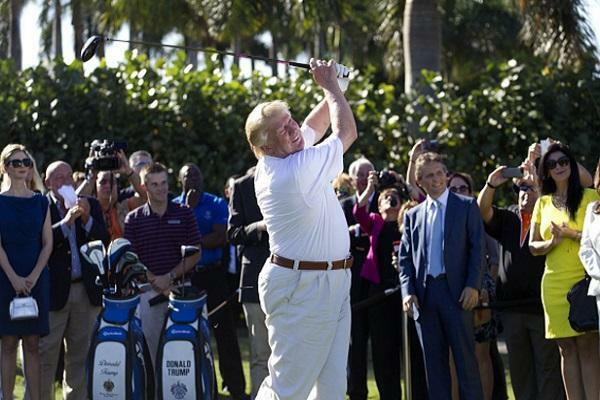 Trump has spent at least 125 days at golf properties during his presidency, according to NBC News.